From April 1 to 5, 2019, the 48th Spring Conference of the Union of Mathematicians in Bulgaria took place in the beautiful resort of Borovets. The conference program included reports and scientific reports in the fields of Mathematics, Informatics, Information Technologies and Methods for their Teaching and Learning. 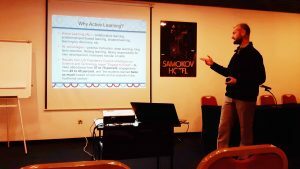 Trayan Iliev from Intellectual Products and Technologies presented the topic “Gamification of Blended Learning with Challenge Unicorder™”. Gamification is the use of gaming and racing elements in the field of learning. IPT Challenge Unicorder is a method and system that allows learning by doing things and (visually) registering for this process. With the use of this new approach, multi-level learning, continuous interaction between the external and the inner world, setting tasks to the level of each learner, timely perception of progress, and others goals are attained.